Glass Packaging Decoration Solutions from Decotech Inc.
At Decotech, we aim to be the top model of responsible capitalism by providing dignified work to our clients, embodying socially and environmentally responsible business practices, committing to continuous process improvement and creating products that add beauty to the world in which we live. Through our extensive global network, we have the unmatched ability to coordinate the manufacturing and decoration of our clients’ glassware at the most advanced facility of its type in the world. We have assumed the responsibility of an end-to-end glass packaging decoration solution for many of our customers in the past, and are confident that our experienced employees will be able to help take care of all your glass packaging needs. 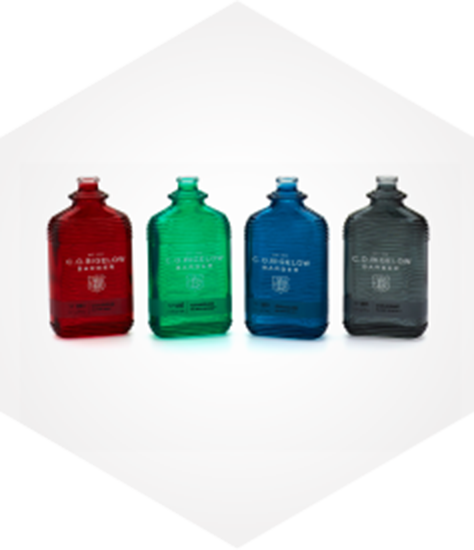 Through our in-house glass packaging decorating, production and testing services, you can ensure your bottle or container will be completed on time and within budget. In fact, with our unique production process, Decotech can shorten total production time to 4-6 weeks, compared to a typical glass packaging manufacturer that can take up to 26 weeks to produce a decorated, finished product. Because we keep everything in-house, and choose not to outsource any of our production or glass decoration services, we are able to significantly shorten our clients’ production time and resources. Additionally, as an end-to-end solution provider, we are able to reduce your company’s inventory by eliminating the need to go to a glass manufacturer for packaging and a separate provider for decoration services. By working with Decotech, the only thing you will have to file under your inventory is the finished product, versus each element of its production. At Decotech, we aim to be the “State of the Art in the Art of Decorating” for the global prestige fragrance, cosmetic, tabletop and giftware markets. We achieve this through our cutting-edge glass decoration technology, constant process and product innovation, the highest level of quality products and unparalleled customer service. Decotech has a long history of industry-leading innovation, and today, we have access to the most unique and cutting-edge glass packaging decoration techniques and technologies in the industry. We also strive to find solutions for any decoration services our clients’ can envision, and as such we are constantly researching and investing in new technologies and techniques to offer our clientele. We provide our clients with solutions that are at the forefront of the glass decoration industry—and we always deliver a top-notch final product that they and their customers enjoy. Decotech is dedicated to excellence, leadership and stewardship with each and every service offering. As part of this mission, we aim to protect the environment around us and the health and safety of our employees and members of our community with each project we complete. Due to the proactive measures we take to improve the environment, the New Jersey Department of Environmental Protection (NJDEP) recognized our manufacturing facility with a Stewardship Initiative. This Stewardship Initiative is a way for the NJDEP to recognize businesses that have initiated programs or policies, on their own, which further conserve resources and reduce toxic waste. In addition to being recognized by the NJDEP, Decotech became certified as an ISO 14001 compliant company in 2009. This certifies that our environmental management system has been assessed and registered by the International Organization for Standardization (ISO) for conforming to its requirements. These requirements include having developed a process to lower our use of raw materials and energy, mitigate the risk of emergency situations in our facility and reduce waste and pollution. View our ISO 14001:2004 Certificate. In our commitment to excellence, leadership and stewardship, we strongly believe that environmental responsibility must be applied, not only to our own operations, but also to those with which we do business. Whenever possible, we avoid purchasing and using raw materials that were manufactured in factories and/or countries that do not follow the same regulations that we do, here in North America. 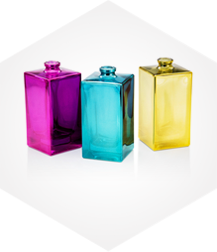 We have provided glass packaging decoration services for the finest fragrance, cosmetic, tabletop and giftware houses in the world. We are confident that we can help you make your packaging vision a reality, with reduced costs and timelines than your current providers. Get started on your next packaging project with us by contacting Decotech today. Call us at 201.569.1900 or fill out our online contact form to learn how we can partner for your turnkey glass packaging needs.